Thanks for all the love of the new range I wrote about last week. I am happy to say that already there has been many frames that have headed off to new homes in the last few days. 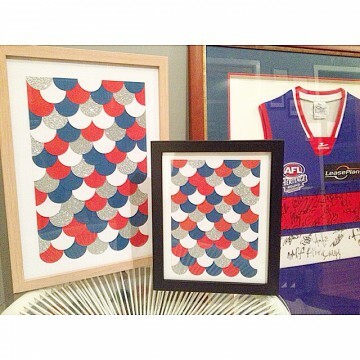 The excitement of the new range combined with my favourite AFL team playing in the finals, I couldn’t help but whip up some frames in red, white and blue. Not only would these look good in a children’s bedroom, but also in a bar/man cave area. That is where one of these are heading at my house. Not sure if hubby would like some ‘crafty’ pieces on the walls alongside his framed guernseys, but I think it will look pretty good! Unfortunately the Western Bulldogs lost their finals game on Saturday night and I was absolutely shattered, so much so I wouldn’t talk to hubby. I was in such a bad mood. But as they all say, there is always next year…. ← New spring range for all rooms.